BMW keep spinning off new models from their line-up in an effort to corner just about every sector of the market. 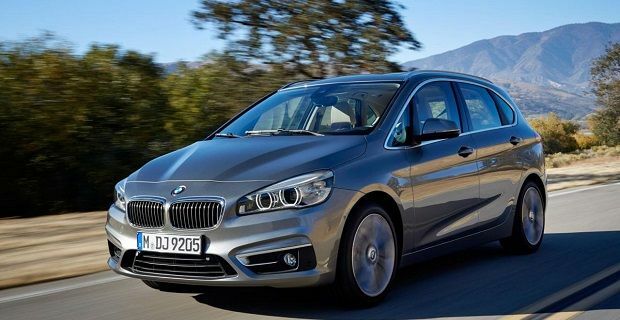 Their latest creation is called the BMW 2-Series Active Touring, but it’s not an elongated version of their 2-Series coupe. Having rationalised their naming structure so that even numbered cars are coupes, such as the 4-Series and 6-Series, and the odd numbered cars have 4 doors, like the 1-Series and the 3-Series, BMW has decided to call his 4-door machine a 2-Series. Confused? You will be. BMW has also gone against their age-old marketing strategy of selling only rear-wheel drive cars as this is their very first front-wheel drive machine. According to the German car maker, their intention with this car is to take on the Mercedes B-Class. The new car uses the firm’s new engines that have been developed for the Mini brand, so there’s a choice of three poweplants. The 1.5 litre three-cylinder petrol unit that gives 57.6mpg and 115 g/km of CO2 is the basic one, but there’s also a four-cylinder diesel that returns 68.9mpg and 109 g/km. At the top of the list is a 231bhp 2.0 litre petrol that’s good for a 0-62mph time of 6.8 seconds and a 146mph top speed. As the engine range is available in the Mini, BMW could have taken on Mercede’s B-Class with the Mini rather than going against everything they stand for. Another issue with this new car is its driving dynamics. With the front wheels doing all the work, making a car that drives like a BMW is going to be difficult. BMW has added a multi-link rear end under its 2.67 metre wheelbase and the German firm has used high tensile lightweight materials to keep weight to a minimum but will those efforts be enough? The interior is lined with all the premium stuff you’d expect to find in a BMW. In a lot of ways, this is the only area of the car that lives up to the firm’s high standards. There’s a head-up display and a BMW ConnectDrive systemwithin the cabin, and you’ll have equipment like cruise control and auto parking. BMW hasn’t announced a pricing structure, but they will have to ask for something like £22,000 for the new 2-Series Active Touring if they want to pitch it against the Mercedes B-Class.